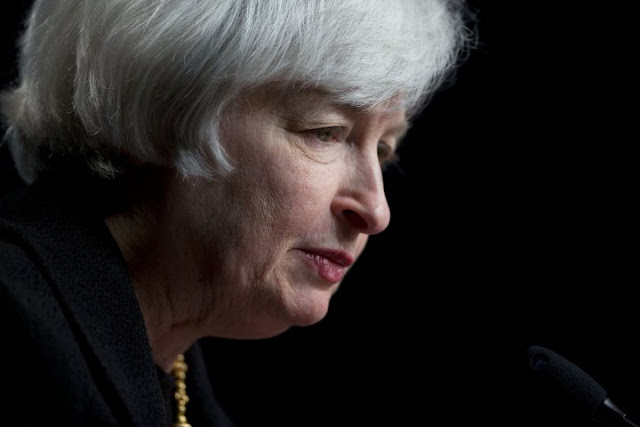 This morning, Federal Reserve Chair Janet Yellen said nothing to rock markets during her speech at the annual monetary conference in Jackson Hole, Wyoming. She kept her comments, on items that would concern markets, neutral to the degree she mentioned them at all. she basically blew up any chances of being reappointed by President Trump to head the Fed once her current term as chair expires on January 31, 2018. Yellen used her high-profile podium to give a robust defense of the regulations put in place under the Obama administration in the aftermath of the financial crisis. She disagreed with the position of President Donald Trump and Congressional Republicans that the regulatory burden is strangling lending and has hamstrung the economy. There is nothing to be cheered about government regulations so, good riddance Janet. But any "deregulation" is going to be stick handled by Goldman Sachs cronies, Trump's economic adviser Gary Cohn and Treasury Secretary Steve Mnuchin, both of whom are Goldman Sachs alumni and no doubt still wear secret Goldman Sachs underwear, will be managing the "deregulation." This will not be good. No doubt, "deregulation" will be beneficial for Goldman Sachs and not so beneficial to Goldman Sachs competitors. Janet might want to call Natacha M.